Are you looking for an easy way to boost the profits from your websites? 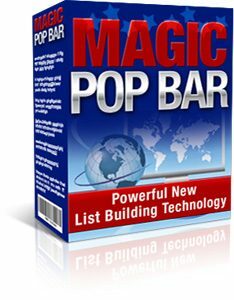 Pop Bars offer a powerful, proven solution that combines the power of popups, without the annoyance factor. They can effectively be used to promote any ad or offer. Visit our demonstration page and you'll see a yellow Pop Bar at the top of the page. If you move your mouse over the yellow bar, a popup will appear. The popup then disappears as soon as you move your mouse away. Because the popup appears and disappears automatically, there is no need for visitors to physically close the popup, reducing the inconvenience for your visitors. With our new software, you can easily add Pop Bars to any website. You can use Pop Bars to show ads for any product/service, signup forms, or anything else you want. These two parts are created separately. The popup part is just an ordinary HTML web page (except that it is smaller than a normal page). This means that you can design just about any layout for your popup, using any HTML editor. Full instructions are included with the software. But the most common use of popups is to show ads and free offer forms. You can create a popup like this in two minutes flat. Just enter the headline and text to be shown on the popup, pick the colors, pick an image file and then paste in a signup form from your autoresponder. Click a button and your complete, ready to use popup is generated instantly. The popup is a standard HTML web page, so you can make changes to it if you want using any HTML editor.